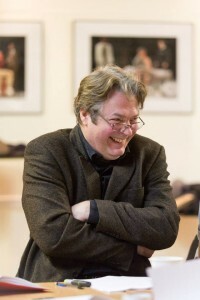 The Thick of It star and general all-round acting master Roger Allam plays the irritable Douglas Richardson, a decent pilot who was fired from Air England due to smuggling. (…) However, it is Allam’s Douglas that is possibly the best character of all. Allam’s smooth sarcastic tones work even better on radio than it does in The Thick of It. You can tell with every sentence that he knows he is better than where he has ended up, but probably can’t be bothered to change his situation, even if he were legally able to do so. It’s an impressive cast – Allam does a great line in supercilious grumps and he is in his element as the snarky first officer to Cumberbatch’s prissy, uptight captain. The highlight (from the Paris episode) being Allam’s smug laugh – “Madame is a humourist?” – as Douglas bartered with Carolyn over a bottle of whisky. Hurray! Here’s the fourth series of John Finnemore’s splendid comedy made magical by the brilliance of its cast. Stephanie Cole plays Carolyn Knapp-Shappey, formidable owner of a one-plane airline. Benedict Cumberbatch is the sole Captain, Roger Allam as First Officer provides a one-man masterclass in timing and Finnemore himself plays the owner’s cheerfully hapless son. There’s enough here to banish the New Year blues, even if your electricity bill just arrived. 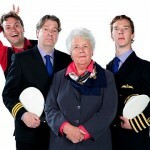 Cabin Pressure is one of the best written, cast, acted and directed comedies on anywhere. 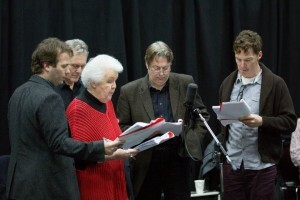 Although only radio can make us picture exactly the single old plane on which this little airline depends, only John Finnemore’s pen plus the sublime talents of Stephanie Cole, Roger Allam, Anthony Head and Anna Crilly could, last Friday, raise a salutary barrier between the turbulent real world on either side of their glorious fiction. A welcome return for the comedy series where the writing and acting are so tight they’re in danger of cutting off your blood supply. The least attentive and most dangerous budget airline in the world – tag line: no job is too small but many, many are too difficult – is flying a party of adventurous tourists to the North Pole. Never has a tiredness for life been so malevolent as in the heart and mind of First Officer Richardson, played with sanguine vitriol by Roger Allam . Not known for his love and admiration of Captain Crieff (portrayed with suitably browbeaten desperation by Benedict Cumberbatch), this flight sees Richardson annihilate any morsel of dignity that the Captain had stored away. And, my goodness, is it funny to witness. Worldweary perfection by Roger Allam. And then there’s Roger Allam’s performance as the bitter first officer who despises his captain. He is to sarcasm and sneering what Rowan Atkinson’s Blackadder was to, well, sarcasm and sneering. What writer John Finnemore has done as well is to add, without tilting things off balance comedy-wise, some depth to the characters. So the dragon of a boss, played by Stephanie Cole, is revealed to be scared of becoming a ‘little old lady’; and the wonderfully supercilious Jeeves/Sergeant Wilson figure, the man who should be Captain but isn’t (a perfect performance by Roger Allam), is shown to have weaknesses of his own. The show deserves an award.